London real estate agents are like the canary in the coalmine for the debt crisis. They can sense early on the next country to get sucked into the vortex. So who’s up next? Apparently it’s the French. Real estate agents have been aware of a new wave of interest for months, but it’s been especially noticeable since Feb. 28. The night before, the then Socialist candidate for French president, François Hollande, who famously said “I don’t like the rich,” announced that, if elected, he would raise the top rate of tax on incomes over €1 million to 75 percent. At home, he got much applause for the announcement. But in London, the news produced a reaction that was noticeable on the computers of the London-based property company Knight Frank. “Since February, when Hollande announced his wealth tax, there has been a large rise in web searches from French customers,” Liam Bailey, head of residential research at Knight Frank, recently told the Daily Telegraph. Those who do the best they can to attract money will probably fare best during this debt crisis. Hours before leaders arrived in Brussels , the Finnish parliament ruled that treaty changes proposed for the European Stability Mechanism (ESM) were “unconstitutional”. The summit was further put at risk with news that after failing stress tests, European banks need to raise €115bn (£98bn) in fresh capital to satisfy regulators. Finland’s grand committee said decisions made by the ESM – the eurozone’s permanent bail-out fund set for launch in 2012 – had to remain unanimous, and not changed to the “qualified majority” that French president Nicolas Sarkozy and German chancellor Angela Merkel have agreed. The Finns are backed by the Netherlands, which fears proposals to withdraw veto powers from the ESM is an erosion of democracy and would make it vulnerable to funding bail-outs without recourse. Meanwhile, the Irish want to block plans for the “convergence and harmonisation” of the eurozone’s “corporate tax base”. The president of the European Council said Friday that a new intergovernmental treaty meant to save the euro currency will include the 17 eurozone states plus as many as six other European Union countries — but not all 27 EU members. The failure to get agreement among all the members of the European Union at a summit meeting in Brussels reflected in large part a deep split between France and Germany on the one hand and Britain on the other. France and Germany are the two largest economies in the eurozone; Britain does not use the euro as its currency. French President Nicolas Sarkozy said early Friday he would have preferred a treaty among all the members of the European Union. But that could not be achieved, he said, because the British proposed that they be exempted from certain financial regulations. “We could not accept this” because a lack of sufficient regulation caused the current problems, Sarkozy said. The new intergovernmental accord should be ready by March, he said. Note Sakozy’s assumption that anyone who hears him talk is a complete moron. The Euromess is a complete and total result of bureaucratic regulation from all angles, to assume people can’t see that is to assume that people are literally mentally challenged. And then to bring it up against the British who avoided this bureaucratic mess precisely by staying out of Euro currency regulations … that, my friends, truly takes the full force of arrogant, negligent, and shameless statesmanship that only a Nicholas Sarkozy could display. Anyway, the number of future member stats is already down to 17+6, the Euro has officially begun to crumble. Expect more states to quit this failed experiment until it finally disappears where it belongs: the dustbins of history. NEW YORK (Dow Jones)–ICAP Plc is preparing its electronic trading platforms for Greece’s potential exit from the euro and a return to the drachma, senior executives at the inter-dealer broker said Sunday. ICAP is the latest firm to disclose such preparations, joining the growing ranks of banks, governments and other key players in the global financial system whose officials are worried enough about the stability of the common currency to be making contingency plans for a possible break-up. The firm has been testing systems that would allow dealer banks to trade the drachma against both the dollar and the euro, the ICAP executives said, cautioning that the measures taken in recent weeks were precautionary. They said the currency pairs would not be accessible for trading unless required by market events, and may never be used. “What precipitated this were customer concerns about what would happen if a country pulled out of the common currency,” said Edward Brown, executive vice president in business development and research at ICAP. The U.K. Chancellor of the Exchequer George Osborne said Sunday that the government has stepped up its own planning measures in recent months to be prepared for a possible collapse of the euro zone. The U.K. isn’t a member of the euro zone, but it is home to Europe’s financial hub and is the world’s biggest currency-dealing center. The 3% ceiling won’t matter anymore from hereon. Consider the European stability treaty dead. One member state after another will violate the requirements. 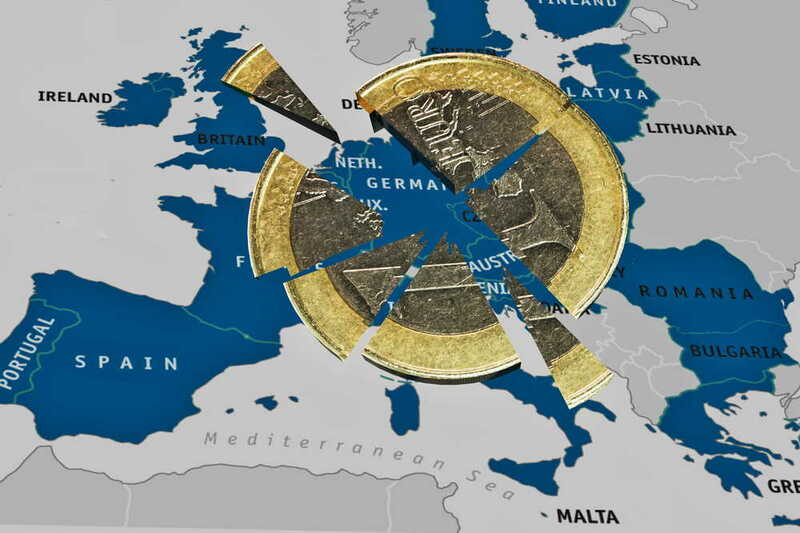 The fact that a bailout of some Euro states by others is discussed, just shows how torn this European Union really is, how severe its imbalances are. With discrepancies like these, it is completely unfeasible to maintain a currency union. The Euro will keep taking its beating for it. The breakup of that currency union is now approaching at an ever accelerating pace. The odds 17 sovereign states “get their act together” quickly regarding a fiscal union is zero. There is no agreement on Eurobonds even from Germany and France, so how are 17 countries supposed to quickly agree on that? Finland and Austria want collateral, and pray tell why shouldn’t they? Is every country supposed to do exactly what you want? Greece is going to default and you and your big ego made matters worse by refusing to accept that fact, so much so that you and the ECB failed to plan for it. You want 17 countries to get their act together. How about one central bank, the ECB, led by you, get its act together and admit your policies have failed? How about the ECB coming up with a legitimate plan for dealing with it this crisis instead of illegally making demands on sovereign nations? The market gave you fair warning on Greece and you refused to see it. Now the market has said “time’s up”. Mr. Trichet, you better come up with a plan to deal with the aftermath, because odds of a Eurozone breakup are large and growing. … actually, in my opinion the best thing that could happen to the Eurozone would be to for it to break up, and take those bureaucratic, corrupt, and destructive leviathans of the European Parliament, the Commission, the Council, and the ECB right with it and thus off the backs of Europe’s sovereign nations once and for all.